This mod is open source and licensed under the MIT license. All carts can be attached and detached by pressing R once while riding an entity with a cart nearby. This hotkey can be changed in the controls. Simply look for "Action Key". If the cart is going too fast, try toggling the slow mode by pressing sprint once while riding. This speed can be changed within the mods settings, but changing it will require a Minecraft restart to take effect. If you want a certain non-vanilla entity to be able to pull the cart, add it to the list of entities in the mod settings. This is cart specific and you will have to find out the id of the entity to add it to the list. Adding minecraft:player will allow you to pull a cart without riding. This cart is the oldest of this mod. It comes with a double chest inventory and has room for a friend of yours to sit comfortably on its back. Good luck on the adventures you shall overcome together. The carts inventory can be accessed by sneaking while right clicking it. If you right click it without sneaking, you will start riding the cart instead. 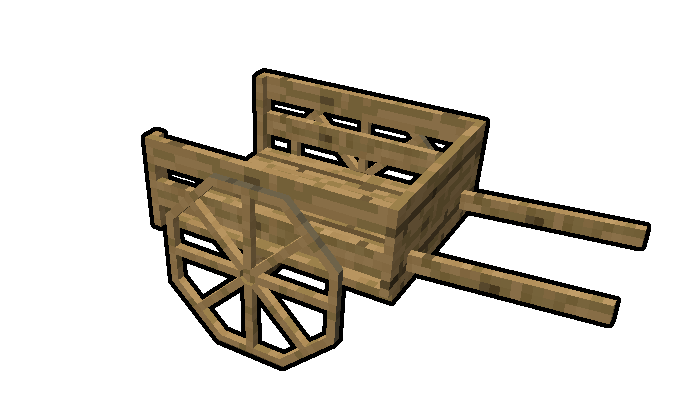 The plow is a useful cart and has been slightly repurposed in v0.1.2.0. Not only can you put hoes in its inventory slots to till up to 3 blocks at once, but also shovels to turn dirt into a path for connecting interesting places within your world. The plowing mode can be toggled by right clicking it. Just like the cart, it's inventory can be accessed by sneaking while right clicking it. This cart is a boat on wheels. Use it to allow both your human and non-human friends to travel alongside you without sweating. You can push entities into the cart to take them along with you and release them by right clicking the cart while sneaking. Right click it while not sneaking and you will start riding the cart yourself. Nice to meet you I am Japanese. I am not very good at English. This sentence also uses Google's translation function. I'm sorry. I am happy to play your mod. Thank you for making this great mod. 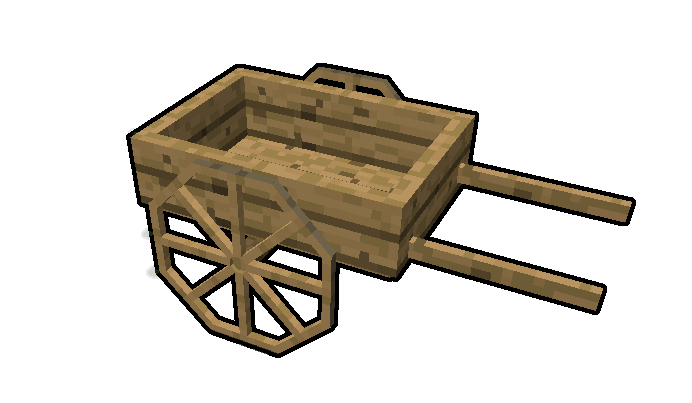 And I'm sorry for the sudden request, but would you like to add the mob transport cart added to the 1.12.2 version to the 1.7.10 version? I have always dreamed of transporting mobs by carriage in the 1.7.10 world. Not sure if I'll do another 1.7.10 port. Maybe if I can find the old files on my external drive, but even then it's unlikely. If somebody else would like to port this mod however - everything is available on GitHub. I understand. The 1.7.10 version of Transportation Cart will give up once. 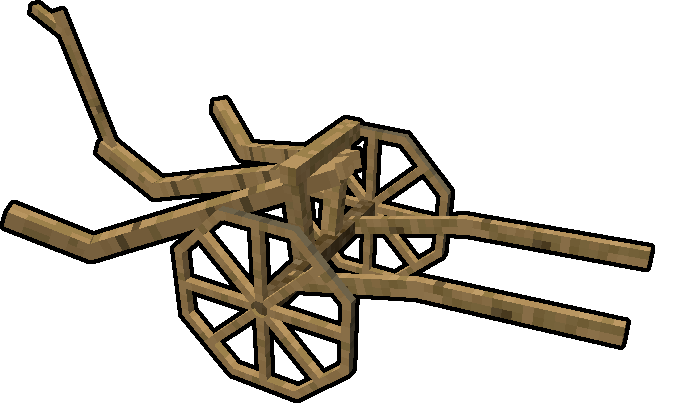 I am grateful to have an elaborate and practical cart in 1.7.10, despite the old version. Your mod has become an integral part of the American Old West world I'm creating. Can you make the horse cart use other mod‘s chests like iron chest to improve the store of cart. I feel like this would pair good with the horse power mod. I especially like the plow; thanks so much! Hello author, can I transfer this mod to mcbbs? I looked into mcbbs and it seems to be a chinese minecraft forum, so feel free to do so. I would appreciate if you could link back to this page if possible. However, it would be great if this mod had an actual chinese translation before being posted on that page. If you could help me with that, let me know. Solo hablo un poco espanol. Not good wnough to translate this mod. I'd appreciate if someone could translate it. If you'd like to volunteer, feel free to send me a PM. Would you consider adding compatibility with Ice and Fire mod's hippogriffs? I will look into it. It might already be possible by just adding the Ice and Fire mods entity ids to the list of entities that are allowed to pull the cart in the config. I looked into the ice and fire mod. The carts can be attached but won't lift off with the entity. I'll see what I can do to improve the compability with flying entities. I couldn't find a way to detect wether or not the hippogryph is flying without creating a optional dependency on the ice and fire mod. I will try to ask the mod author to set the fallDistance to 0 while flying instead. Hello, just fixed a critical issue that prevented carts from being spawned on servers. Please update, I am sorry for any trouble caused by this. If you find issues, please report them either here or on GitHub. Am playing this mod in Sevtech, and the key mapping isn't working. It's bound to the default key, 'r', but when I am riding the horse, and press 'r' nothing happens, except the r key clicks at me. Any ideas? Nm: had to switch the mapping to another key (used semi-colon), and it worked. Hello, v1.2.0 has just been uploaded. Most importantly for you; the recipes have slightly changed. I will update the project page with the new ones soon. For now, refer to the ingame recipe book. To toggle between slow and fast riding, press the sprint hotkey while having a cart attached. You can adjust the slow speed in the mods config, this will require a restart of the game. The new mob transportation cart will act just like the minecraft boat - push an entity into the carts bounding box to have it start riding the cart. The cart fits up to 2 entities. The entities can be released by right clicking the cart while sneaking.